Grazing constitutes one of the most important processes of soil degradation due to compaction, and it affects both vegetation and soil in arid and semiarid ecosystems. Compaction modifies the soil structure and causes an increase in the proportion of small aggregates, which consequently leads to an increase in bulk soil density. Compaction also produces a decrease in soil organic carbon content. The soil becomes more densely packed, causing reductions in porosity and storage capacity. Magnetic Resonance Imaging (MRI) was used to obtain a relative estimate of soil water content and porosity. The signal intensity from proton density images, which corresponds to the amount of water present in a sample, is lower in compacted soil. As calculated from the image signal intensity, the porosity percentage is also lower in grazing soils in comparison with natural recovery soils. 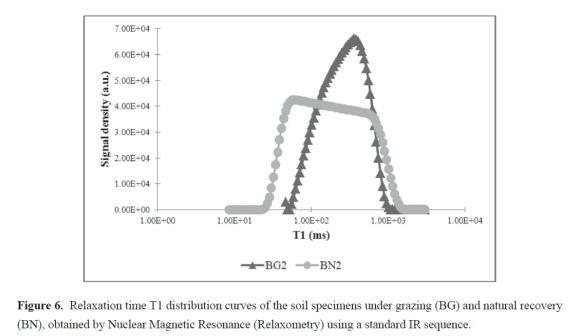 H NMR relaxometry studies demonstrate shorter T2 and T1 relaxation times in grazing soil samples, suggesting lower pore sizes in these soils. Moreover, the grazing samples have a monomodal distribution of T1 with a narrow band, indicating greater homogeneity in the pore sizes. The bimodal distribution of T2 complements this result and indicates a greater proportion of smaller-size pores with greater homogeneity between them. There is a significant positive correlation between the porosity values determined by both methods, which demonstrates the validity of the MR technique. The relaxation times also show positive and significant correlations with analytical porosity. The application of MR techniques to soil compaction studies demonstrated the natural recovery of the physical properties of deteriorated soil after grazing damage in pastoral systems brought about by complete animal exclusion for ten years. Keywords: Soil compaction, porosity, Magnetic Resonance Imaging, Relaxometry, grazing. Grazing constitutes one of the most significant processes of soil degradation due to compaction. The constant trampling of the soil by animals leads to its compaction, reducing the volume of the spaces in and increasing the bulk density of the soils. The particles are more densely packed, which leads to a decrease in porosity, particularly regarding macropores (Glinski and Lipiec, 1990), and alters the soil surface. Soil compaction is directly associated with a decrease in organic matter in the surface horizon (Xie and Witting, 2004). This observation can be attributed both to the poor living conditions many soil organisms encounter in these compacted environments and to the nature of the soil's plant cover (grasslands). The consequences of these processes include the reduction in of the infiltration and water storage capacities of soils (Li et al, 2008), a decrease in grassland productivity grazing quality (Martinez and Zinck, 2004), and the general acceleration of soil erosion. A soil's vulnerability to degradation depends largely on its properties, particularly those properties related to permeability and porosity: texture, structure, coloid content (organic matter, clay), etc. Soils with fine textures and high percentages of silt and clay retain greater quantities of water than soils with a coarse texture; these fine-textured soils are more compact, and the movement of air and water through them is slower (Daum, 1996). Soil structure also affects the movement and retention of water. Loss of structure is therefore a form of soil degradation; compaction reduces the pore space and blocks the flow of water (Bronick and Lal, 2005). Organic matter constitutes an essential component in the formation of structure, although its content in the soil is lower than that of other mineral components. Soils with high organic matter produce more stable aggregates that resist compaction, while soils with low proportions of organic matter are more susceptible to compaction (Schulten and Leinweber, 2000). The scarcity of biomass in a grazed area leaves the soil surface unprotected, which leads to its disintegration from the direct impact of rain and a decrease in infiltration (Casermeiro et al, 2004). These factors cause slower drainage rates in grassland soils. Magnetic Resonance Imaging (MRI) can be used to obtain a relative estimate of a soil's water content and can provide absolute values by comparison of the signal intensity obtained with that of a known quantity of water (Hall et al., 1997). Any Magnetic Resonance (MR) image of soil depends on the MR signal elicited from the nuclei of hydrogen atoms in the water contained by the soil. This signal is defined by its amplitude, frequency, phase and duration, and it is affected by certain MR properties of water in soil, such as T1 and T2 relaxation time constants. In MR experiments, the soil sample is exposed to a magnetic field that induces a nuclear magnetisation of water protons along the direction of the magnetic field. A sequence of radio frequency (RF) pulses reorients the magnetisation so that it is no longer in its equilibrium state. The relaxation, or the return to equilibrium position, can be quantitatively measured. The signal acquired during relaxation process contains information both on the density of nuclei 1H, from which can be obtained the porosity, and on the properties of the pore space, which can be extracted from the T1 and T2 relaxation time constants (Bortolotti et al., 2006b). An assessment of MRI as a porosity measurement tool for porous media other than soils, such as rock samples, was conducted by Borgia et al (1996). The main limitations encountered during the study of the soil-water system with MRI are poor signal-to-noise ratio (S/N), poor spatial resolution and image distortions, all of which are primarily caused by the variation of the magnetic susceptibility in the soil. The contents of clay, free iron oxide, exchangeable cations and organic matter influence the MR parameters and therefore the ability of MRI to accurately detect soil water (Hall et al., 1997). These difficulties can be overcome by using the appropriate MRI pulse sequences. The MR signals also supply information on the properties of the pore space, which can be deduced by relaxometry (Schaumann et al., 2005). 1H NMR relaxometry was first used in soil science in 1970 to measure the water content of soil samples (Prebble and Currie, 1970). The correspondence between pore size distribution and relaxation time was established by Brownstein and Tarr (1979), and the dependence of T1 and T2 relaxation times on soil type, soil water content and pore size was demonstrated by Van As and Van Dusschoten (1997). Magnetic Resonance has many advantages over other measurement methods in soil applications. The technique is fast and non-destructive, can determine the total amount of protons in the water contained within the pores and is broadly independent of the solid soil characteristics. The combination of MRI and MR Re-laxometry (MRR) methods has already been applied to the study of water absorption kinetics in pore systems (Bortolotti et al., 2006) and yielded a synergetic improvement of the results. However, we found no previous records in the literature of the joint application of both techniques to study soil structure recovery. The aim of this work was to evaluate both MRI and MRR for the assessment of soil compaction due to grazing and to demonstrate the complementary nature of these two techniques in the study of soil porosity. A case study of the natural regeneration of soil physical properties after grazing was examined. Soil porosity and soil water content were estimated using MR in both grazing soils and no-grazing systems. To assess the value of MR techniques in this study, the MRI and MRR results for the soils were compared with moisture, bulk density, percentage of water retention, particle density and total porosity data obtained using alternative analytical methodologies. The studies were conducted in the district of Arevalillo de Cega, in the east of the province of Segovia, in the central area of the Iberian Peninsula (40Â° 46' and 41Â° 35' N, 3Â° 13' and 4Â° 42' W). The altitude of the area is 1,100 m, its annual average rainfall is 478 mm, and its average temperature is 11.9°C. The natural vegetation consists of perennial grasslands with a predominance of Thymus mastichina. The soils used in the study were calcareous Leptosols developed on Cretaceous limestone. These soils consist of 60.70%, 13.00% and 26.30% sand, silt and clay, respectively (González and Candás, 2004). This area has been used as natural pasture for hundreds of years, over which it has been open to the free transit of sheep. A rectangular area of 3200 m2 was cordoned off for ten years and closed to the passage of sheep. It has been estimated that ten years of grazing is sufficient time to produce soil compaction and restriction of the movement of water through a soil profile due to the modification of its physical parameters (Linnartz et al., 1966). Ten years of no grazing were chosen as a treatment to evaluate the natural recovery of physical properties in grazing-damaged soil. A paired sample design was employed in this study. Three sample points were located in the un-grazed area (natural recovery treatment, BN), and three were located outside of the excluding fence (grazing treatment, BG). The distance between paired samples (BN1 to BG1, BN2 to BG2 and BN3 to BG3) was 30 metres. A composed sample of the soils (n=3) was taken at each selected point, both in the natural recovery state area (BN samples) and the grazing area (BG samples), at two different depths (0-10 cm, 10-20 cm). The samples were collected following the methodology proposed by the FAO (2007), and colour was determined in situ using Munsell tables (2009). Unaltered soil samples were taken at all points using methacrylate cores (5 cm inner diameter and 5 cm high) for studying the magnetic resonance and physical properties of the soils (USDA, 1999). The analytical determinations were conducted on the fine earth fraction after air drying and sieving using the following parameters: organic carbon (OC) by wet oxidation, pH in water suspension (1:2,5), and electrical conductivity, EC (ISRIC, 2002). The aggregates were gently isolated while moist, and fractions of less than 53 um and 53-2000 um were isolated. The percentages by weight of each one were then determined (Cambardella and Elliot, 1992). The following parameters were determined using the unaltered samples collected in Ejelkamp cylinders: moisture (%), bulk density (g/cm3), water storage capacity, particle density (g/cm3), and total porosity (%) (Koorevaar, et al. 1983). All Magnetic Resonance Imaging (MRI) and relax-ometry (MRR) experiments were performed using a BIOSPEC BMT 47/40 spectrometer (Bruker, Ettlingen, Germany) at 4.7 Teslas (200 MHz resonance frequency for protons). Magnetic field gradients for imaging were generated by a 12 cm actively shielded gradient set capable of reaching 200 mT/m. The individual unaltered samples, contained in methacrylate cylinders, were previously wetted, and their moisture contents were maintained at approximately 100% of their water holding capacity (the soils were saturated and allowed to reach equilibrium). Individual samples were placed in a radio frequency birdcage coil (inner diameter of 7 cm) for the MR studies. For the MRI experiments, a global shimming was performed prior to image acquisition. Axial, coronal and sagittal images were acquired for sample localisation using spin-echo experiments. The acquisition parameters for these images were as follows: repetition time TR = 200 ms, echo time TE = 10 ms, field of view FOV = 10 cm, slice thickness SLTH = 5 mm, matrix size = 128x128 and number of acquisition NEX=1. For T2 relaxation time measurements, 20 echoes of axial slices using a spin-echo sequence were acquired. For these experiments, the TR was 2000 ms, and the echo time TE was fixed at 4.5 ms, resulting in an echo train varying from 4.5 to 90 ms. The FOV was 7x7 cm2, and the matrix size was 128 x 128. The signal was averaged 4 times. Ten slices with a thickness of 5 mm were obtained. T1 relaxation time measurements were conducted on the same slices using a spinecho sequence. Separate images were acquired at seven different recovery times. TR varied from 250 to 6000 ms, and the TE was 4.5 ms.
Based on the sequences described above, the values for T1 and T2 were calculated for several regions of interest (ROI). The Image Sequence Analysis (ISA) utility of the ParaVision 3.0.1 package (Bruker, Ettlingen, Germany) was used to fit the signal intensities to the exponential function of the spin-echo signal (Young et al., 1982). T1 values were calculated from the series of saturation recovery spin-echo images with different repetition times (TR), while T2 values were calculated from the series of spin-echo images with different echo times (TE). The ROI were selected from the interior of the cylinder (upper left corner image of figures 2a and 2b); the outer edge of the cylinder was ignored to avoid the contribution of any spaces connected to the surface of the cylinder or any possible effect of the cylinder's drag on the soil structure during sample acquisition (Borgia et al., 1996). Signal Intensity of the signal at equilibrium magnetisation was also obtained, and T1, T2 and signal intensity maps were calculated using the same software (ParaVision 3.0.1, Bruker, Ettlingen, Germany). 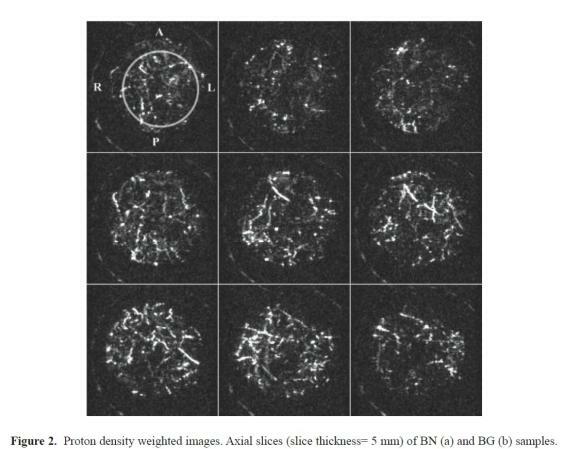 To calculate porosity from the images, we followed the methods of studies in which this percentage is determined by relating the measurement of the signal intensity with internal references (Borgia et al., 2001). The final processing of the images was performed using Image J software for Windows. The relaxometry experiments were conducted on the same samples immediately after the image experiments, without any further handling of the samples. These measurements were used to obtain the distribution curves using the modified UpenWin program (López-Arce et al., 2010). For T1, a standard IR sequence was used, with 50 inversion times varying from 15 to 750 ms. For T2, a CPMG sequence was used, and 50 echoes with TE = 800 ms were registered. The statistical analysis of the results was performed using the SPSS v.19 statistics program (Microsoft Windows). A one-way analysis of variance (ANOVA) was performed using the Fisher-Snedecor F distribution method with a confidence level of over 95% ( p < 0.05). Bilateral correlation studies were also conducted, using the Pearson method. 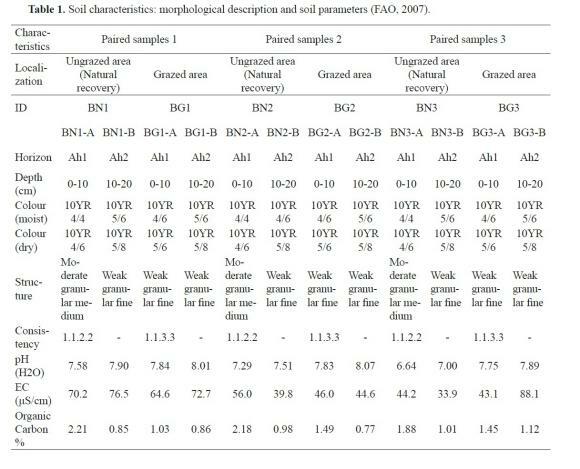 Table 1 shows the descriptions of the soils and the results of soil parameter measurements for both the grazing areas (BG treatment) and the ungrazed regions (BN treatment), in which the natural recovery of soil physical properties was evaluated after ten years of no grazing. The changes observed in the ungrazed soils after ten years of sheep exclusion are particularly evident in surface horizons (0-10 cm depth), as was reported previously by Drewry et al. (2006) in short-term (one year of no grazing) and long-term (no grazing for up to three years) studies. The grazed areas show a slight increase in the chroma value. There is a clear trend of decreasing organic carbon (OC) in the surface horizons of grazing soil samples. These results agree with those of Sigua et al. (2009) and Bisigato et al. (2008), in which the reduction in soil organic matter was attributed to diminished plant cover due to grazing pressure. Heavy grazing leads to the excessive defoliation of herbaceous vegetation, reducing standing biomass, basal cover and plant species diversity (Bilotta et al., 2007). The difference in OC was related to differences in the soil structure, the litter layer, the standing biomass and the basal covers by Tessema et al. (2011). These differences in OC content were less pronounced as depth increased. Soil structure is also weakened in grazed sites, being reduced from moderate to weak quality in these soils (Table 1). The pH values are higher in grazing soils, most likely due to their lower organic matter content; the greater the depth, the higher the pH values, as the amount of plant remains decreases. These results for organic carbon and pH agree with those obtained by other authors (Steffens et al., 2008; Xie and Witting, 2004; Young-Zhong, 2005). The EC decreases slightly in surface grassland horizons as previously reported by Tessema et al. (2011). There is a decrease in larger aggregates and an increase in smaller aggregates in grazing soils compared with ungrazed soils, which may indicate the effects of compaction on grazing soils (Figure 1). The compaction process of the soil after grazing has been previously described by other authors, such as du Toit et al. (2009), Bilotta et al. (2007) and Betteridge et al. (1999). The effect of soil compaction is to decrease soil porosity, particularly the volume of the large inter-aggregate pores (macropores). Recovery of damaged soil surfaces due to improved soil porosity has also been reported after the removal of sheep in semi-arid woodlands. The porosity of areas left un-grazed for either 8 or 16 years was greater than that of regularly grazed soils (Drewy, 2006). Table 2 shows the average values for the physical properties of the soils for the two experimental treatments. A decrease in the porosity of grazing soils can be observed in comparison with natural soils; this result can be explained by compaction through the action of sheep. The moderately high amount of clay in the soils in the area (>25 %) (González and Candás, 2004), the lower proportion of organic carbon and the greater percentage of fine aggregates points to the alteration of macropores into micropores, as there is also an increase in micropore number in impacted soils. A decrease in macropores leads to a reduction in soil aeration and a tendency towards surface flooding (Proffitt et al, 1995); macroporosity is thus an important indicator of soil quality (Drewry et al., 2008). A slight increase was observed in the bulk density values for soils under grazing (du Toit et al., 2009; Greenwood et al., 1998; Warren et al., 1986), and the values for particle density, which is conditioned by the mineral nature of the soils, were similar. Water retention is slightly lower in grazing soils than in natural soils due to their lower organic matter content (Golodets and Boeken, 2006). The moisture percentage, however, is somewhat greater in impacted soils; this could be caused by a reduction in the moisture loss through transpiration in these areas (Stavi et al., 2008). There is a significant negative correlation between OC and apparent soil density (r = -0.891*;* correlation significance level 0.01), which highlights the influence of organic components on soil density. This correlation has been previously described by other authors (Stavi et al., 2008). There is also a negative correlation, although not a significant one, between pH and OC; greater OC contents are associated with lower pH values. There is a very significant negative correlation between bulk density and water retention (r = -0.968**) and a significant positive correlation between bulk density and moisture (r = 0.856*; *correlation significance level 0.05). Moisture is negatively and significantly correlated with porosity (r = -0.869*), and pore size plays a more important role than total porosity; the larger the pore, the higher the moisture content, as water will be less easily lost from the soil. There is also a significant negative correlation (r = -0.845*) between moisture and water retention. Finally, it is worth noting the nonsignificant positive correlation of porosity and OC due to the influence of organic components in the formation of aggregates (Bronick and Lal, 2005). The analysis of variance of the average values (ANOVA) highlights the significant differences between natural soils and soils impacted by the action of sheep regarding organic carbon (0.014), bulk density (0.003) and water retention (0.018). The anthropic action of grazing produces modifications in the characteristics and physical properties of soils, fundamentally on the surface levels (0-10 cm), as has been demonstrated by analytical methods. A decrease in the content of organic carbon, a slight increase in bulk density and a decrease in the percentage of water retention were observed in grazing soils in comparison with no grazing systems. There is also an increase in smaller-sized aggregates (< 53 μm), a decrease in the percentage of porosity and an increase in moisture after grazing. 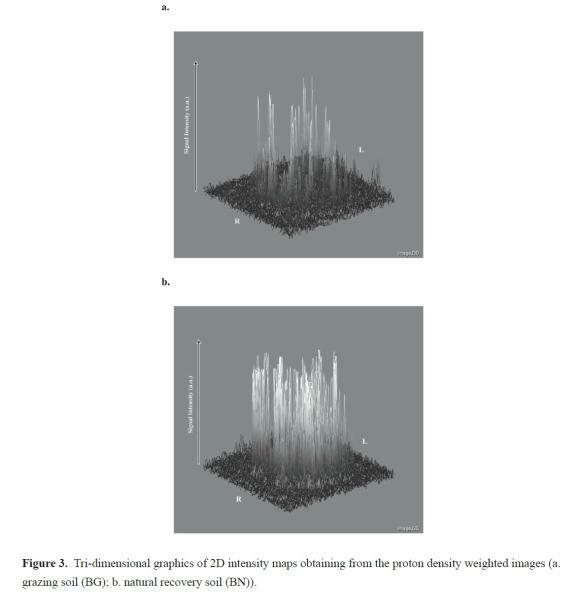 Figure 2 shows the proton density weighted images (TR = 2000 ms; TE = 4.5 ms) for 9 axial slices of sample cylinders taken from both natural recovery soil (BN) (figure 2, top) and grazing soil (BG) (figure 2, bottom). Proton density contrast is a quantitative summary of the number of protons from free water present in the sample. The higher the number of protons is in a given region of soil, the greater the transverse component of magnetisation and the brighter the resulting signal on the proton density contrast image. Conversely, the lower the number of protons is in the sample, the less the transverse magnetisation, and the darker the signal on the proton density weighted images. The visual analysis of the signal intensity in the BN images shows that it is higher than the signal obtained in the BG slices as it is the MR signal related to water content (Duval et al., 2010). A different distribution of water within each sample can be observed, indicating different porosities. MRI parameters: spin-echo sequence, TR= 2000 ms, TE= 4.5 ms, FOV= 7x7 cm2, matrix size 128x128. Soil samples were placed in methacrylate cylinders (5 cm inner diameter and 5 cm high). Region of interest (ROI) marked on upper left corner image of figures 2a and 2b. The outer ring and aliasing artifacts come from the radiofrequency probehead. The calculation of the signal intensities of the MR images from each of the samples also highlights this difference. Considering the average signal intensity obtained from 10 slices in the sample, the values are twice as great for BN soils (2.94E05 signal intensity a.u.) than for BG soils (1.45E05 signal intensity a.u.). Similar results were found when total signal intensities were considered (5.61E10 signal intensity a.u. in BN soils versus 3.01E10 signal intensity a.u in BG soils). Figure 3 shows the tri-dimensional graphics of the maps of intensities obtained from the proton density weighted images. The figure provides an indication of the location of the water and therefore of the porosity of the samples. 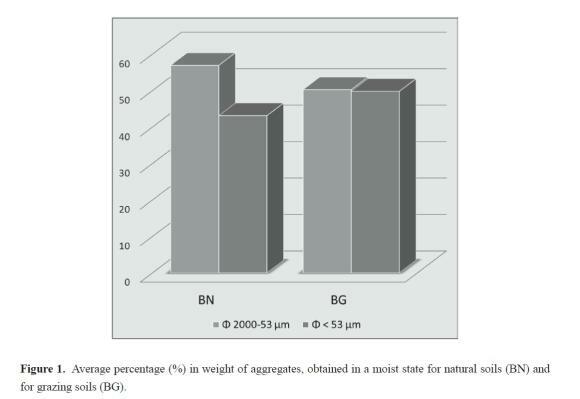 The water content of the BG (a) sample is lower than that of the natural soil sample, BN (b), which implies a lower porosity for the BG (a) soil. 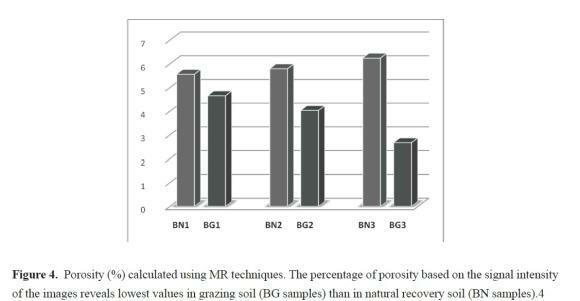 The numeric calculation of the percentage of porosity, based on the signal intensity of the images, also reveals a decrease in this figure for grazing soil in comparison with natural soil in all cases (Figure 4). The local determination of porosity using NMR imaging techniques was previously reported in heterogeneous samples, such as carbonate cores (Borgia et al., 1996), confirming the quality of the method as a tool for measuring porosity in these matrices. The study of the parameters T1 and T2 (relaxation times inherent in each sample) supplements the porosity study conducted using MRI because it allows us to differentiate between samples, or between regions of a sample, with the same local porosity but different pore sizes (Borgia et al, 2001). The effects of water content on NMR parameters may be described from the T2 curve (Duval et al., 2010). As the initial signal intensity is proportional to the sample proton content, and because water is the most abundant protonic structure in our system, this result explains the reduction in signal intensity observed for grazing soils in comparison with ungrazed soils. The water relaxation time is highly sensitive to water content, which explains the more rapid decrease in the T2 signal observed for the grazing soils. T2 relaxation is directly related with molecular mobility, i.e., slower molecular mobility is associated with shorter relaxation time (Duval et al., 2010). The values for T2 relaxation time are therefore related with pore sizes, and samples with larger pore sizes have longer T2 relaxation times (Viola et al., 2006; Appolonia et al., 2001). Bird et al. (2005) associated long relaxation times with the free water located between the aggregates and in the interiors of the larger-sized pores, whereas shorter relaxation times were associated with the water bound to the smaller-sized pores located inside the aggregates. If we observe the curve for T2 (Figure 5), we can see a sharper drop in the curve (shorter T2 relaxation time) for the grazing soil sample (average of BG1, BG2, BG3). This result indicates a greater content of bound water and a smaller pore size. 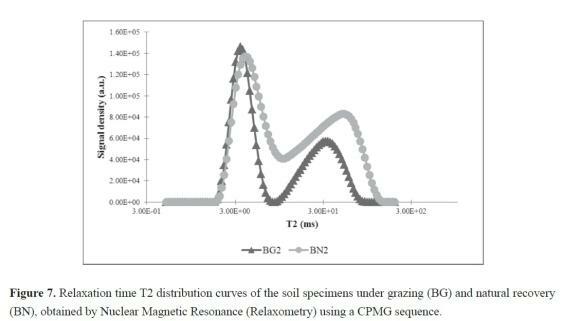 The natural recovery soil sample from the grazing exclusion condition (average of BN1, BN2, BN3) shows a slower drop in the T2 curve due to the longer T2 relaxation time. This result is associated with the presence of a greater quantity of free water in this soil and a greater pore size. T1 Relaxation time is known to be an indicator of water mobility and its interactions with environmental conditions such as polymer presence and pore size (Faure and Rodts, 2008). In bulk water, every molecule has the same environment, and a single T1 value is observed for the sample. In complex media, such as soil, water molecules embedded in the sample may be confined in pores of different sizes. Because these molecules may experience different local environments, relaxation data become multi-exponential, and various T1 values may be exhibited. A well-known trend is that T1 usually decreases with decreasing pore size (Faure and Rodts, 2008). If we observe the curve for T1 (Figure 5), we can deduce a similar behaviour of the soils as that described for the T2 curve. 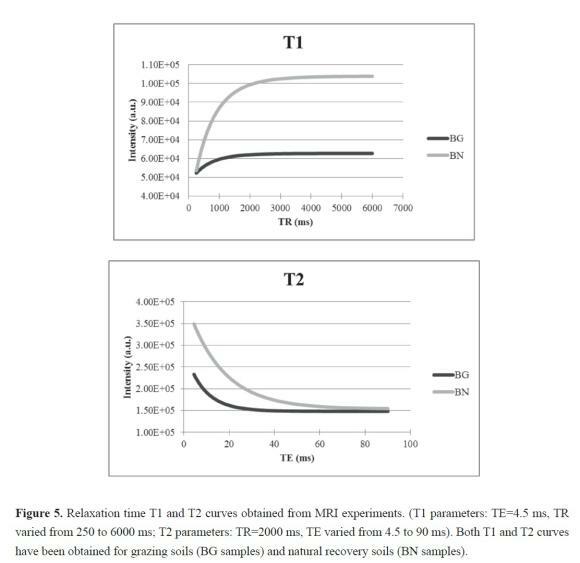 The "BG average" sample has a shorter T1 value than the "BN average" sample, showing that its longitudinal magnetisation is recovered much more rapidly. 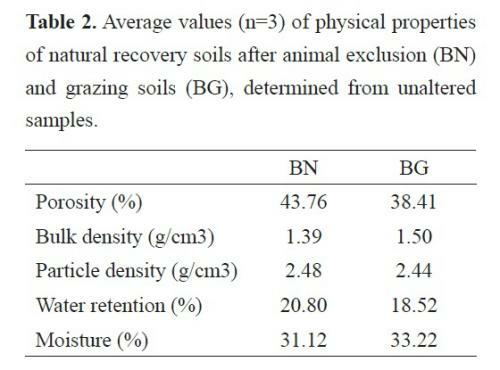 This indicates the presence of a greater quantity of bound water in soils under grazing conditions and therefore a lower pore size in grazing soils (BG) than in the recovery treatment (BN). For other complex media, such as cement pastes, long T1 relaxation time values were attributed to water with free movement between cement grains, while short T1 values were attributed to water inside the cement grains that had less mobility (Faure and Rodts, 2008). Similar T1 and T2 curves were reported for two sludge mixtures with different dry matter percentages (Duval et al., 2010). The shapes of the relaxation time distribution vary in terms of peak position (peak relaxation time) and peak intensity (peak water content), as has previously been reported for different soils (Jaeger et al., 2009). There is a correspondence between the distribution of the pore size in the sample and the distribution of the T1 and T2 relaxation times (Kleinberg, 1994). Narrow T1 distributions are an indication of micro-structural homogeneity and thus of the presence of pores of similar sizes. In contrast, broad T1 distributions show the presence of a wide distribution of pore sizes (Viola et al., 2006; Bird et al., 2005). The relaxation time T1 distributions for BN and BG soils are shown in figure 6. The grazing soil (BG) has a narrow distribution, indicating a greater homogeneity and the presence of pores of nearly the same dimensions. On the contrary, the BN sample has a wider distribution of T1, which suggests a wider pore size distribution for the natural soil sample. The values for T2 follow a bimodal distribution for the two samples, reflecting the presence of two different pore sizes in both BG and BN soils (Figure 7). The initial maximum, with lower T2 values, corresponds to pores with smaller sizes, which are found in higher concentrations in the sample that has undergone compaction. The pores with larger sizes are related with higher T2 values (to the right of the distribution). These values are more abundant in the natural recovery soil sample. It is worth noting that although there is a bimodal distribution of T2 for the no grazing areas, it shows less clearly defined peaks, indicating that the sample is less homogeneous than that of the grazing soils. Correlation analyses were conducted between the porosity determined by MR and the values of the relaxation times (T1 and T2) and the soil parameters and physical properties of the soils determined in the laboratory. A very significant positive correlation (r = 0.932**) was found between the porosities determined in the analyses and those obtained in the MR images, which confirms the validity of this technique for determining the porosity of a porous medium, such as soil, using the parameters for the acquisition of images described in the Methods section. Moreover, a significant positive correlation was found for the porosity values obtained by MR and water retention (r = 0.861*), whereas significant negative correlations were observed between porosity and bulk density (r = -0.848*) and porosity and moisture (r = -0.827*). A positive and significant correlation was also obtained between relaxation times and analytical porosity (r = 0.985*). These results demonstrate the complementary nature of both MRI and MRR techniques in the study of the porosity and their usefulness for the assessment of soil compaction in a soil structure recovery study. The application of the Magnetic Resonance Imaging and 1H NMR relaxometry analytical methods has shown that grazing soils become more densely packed in comparison with no grazing soils. This impact produces a decrease in porosity and consequently reduced water retention. We examined the potential for grazing exclusion to promote the natural regeneration of these soil physical properties. The natural recovery of deteriorated soil physical condition after grazing is limited to 10 cm of depth. Transverse relaxation NMR measurements have been used to study the pore space characteristics of both treatments (grazing and ungrazing soils). There is a greater proportion of smaller-sized pores and a greater homogeneity between them in grazing soils in comparison with soils recovered after ten years of animal exclusion. The correlation between analytical porosity and porosity calculated by imaging, as well as relaxation times, further validates the MR technique for the study of a porous system such as soil. The results confirm the quality of the applied methods and the use of MR imaging and relaxometry as valid tools for measuring the effects of grazing systems on soil compaction, as well as for analysing the porosity and estimating the water content of soils. The authors are grateful to M.E. Fernández Valle, from MR C.A.I. (UCM), for her support with MRI data acquisition and Relaxometry analyses.